Vollrath Company, a leading manufacturer of foodservice equipment and smallwares, will demonstrate its popular line of Redco® Manual Food Processors in its “Fresh is Best” exhibit in booth #4037 at the 2016 National Restaurant Association® (NRA) Show, held from May 21-24 in Chicago, Illinois at McCormick Place. The perfect solution for operations sourcing fresh, locally grown produce, the Redco collection offers increased speed and safety during food preparation, along with significant labor savings, higher food quality, more consistency, and less food waste – ultimately making any operation more profitable. Speed. Efficiency and speed are crucial when slicing, dicing and preparing food in a busy kitchen environment. The Redco Fruit Slicer features 28 blades that operate in a single stroke operation, eliminating 75 percent of the time and cost associated with cutting fruits in the kitchen. The non-corrosive blades never require maintenance and the unit’s 5-inch cutting area is optimal for large fruit like pineapples, cantaloupe and honeydew melon. Labor Savings. If an operation has staff on-hand with less experience, manual food processors are more cost effective and safer than traditional powered-food processors. 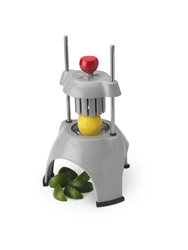 Great for bars and restaurants, the Redco Wedgemaster® II significantly reduces labor time when prepping fruits and vegetables like lemons, limes and potatoes in a fast-paced environment. Constructed with polycarbonate materials, this unit is durable and dishwasher-safe. Quality. Addressing the popular trend of sourcing fresh, locally grown produce, quality is extremely important and Redco’s Manual Food Processors allow an operation to focus on providing fresh, healthy food to its consumers daily by eliminating the need to purchase fruits and vegetables that have been prepared off-site in a separate facility, which compromises the taste, safety and overall freshness of the product. The Redco Lettuce King® can cut lettuce, cabbage, cucumbers, cantaloupes and cooked chicken. It eliminates 75 percent of the time and cost of shredding lettuce with a knife, and eliminates the need for purchasing produce that has been pre-shredded or pre-packaged. Consistency. All of the Redco Manual Food Processors provide a consistent appearance to ensure that the fruit or vegetable looks the same every day and with every slice and cut. The Redco InstaCut™ 5.0 lets the user slice, dice, wedge and core all with one product. Four simple pop-in, pop-out blade accessories make switching from dicing onions to coring apples a fast and efficient process in any commercial kitchen. And the sled-leg design provides a stronger, sturdier unit that offers superior resistance to breakage. Vollrath will feature the following Redco Manual Food Processors in its booth at the NRA Show: InstaCut™ 5.0, InstaCut™ Cucumber Slicer, Wedgemaster™, InstaBloom® II, Onion King®, Lettuce King® V, Fruit Slicer, King Kutter™, Cube King™, Cheese Blocker™, InstaSlice™, and Tomato Pro™. Vollrath’s Redco Manual Food Processors have been recognized with an FE&S Best in Class Award for Manual Food Choppers for six consecutive years. The National Restaurant Association Show will take place from May 21-24, 2016 at McCormick Place in Chicago, Illinois. In addition to the Redco manual food processors, Vollrath will have new and existing products on display at booth #4037 in the South Hall. For more information on Vollrath’s product offerings, visit http://www.vollrath.com. For details on the 2016 NRA Show, visit show.restaurant.org. Vollrath Company, based in Sheboygan, Wisconsin, has a reputation for the design, development and manufacture of the foodservice industry’s finest smallwares and equipment. With a collection of exceptional people, industry leading products, and helpful consultative services, Vollrath is assembled for one purpose – to advance the art of hospitality. For more information about The Vollrath Company, its products, facilities in the US, Europe, Mexico and China, and the 19 foodservice industries it serves, visit http://www.vollrath.com. Stay connected with Vollrath on Facebook, Twitter, Instagram, YouTube, Google+ and LinkedIn.